(P1) Cafe owner Nicole Massa Helm says her workers keep disappearing. (P2) She knows exactly where they have gone – to work in a CASINO. (P3) Ms Helm’s business, Lax Cafe, is based in Macau, the tiny Chinese special administrative region, 60km (37 miles) west of Hong Kong. (P4) A former Portuguese COLONY, Macau is one of the most crowded places on the planet. (P5) It may have a population of just 643,000, but they are CRAMMED into an area of only 30.3 sq km (11.6 sq miles). This makes Macau the world’s most densely populated country or territory. 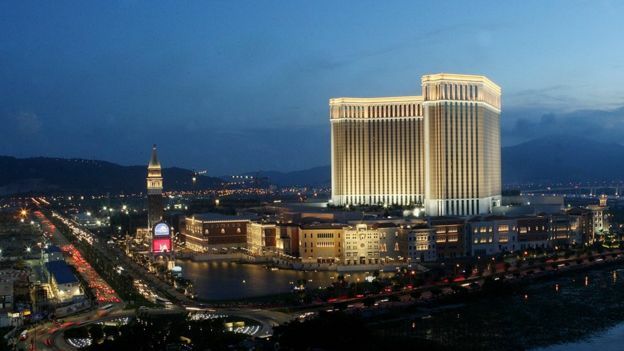 (P6) Towering over Macau’s economy are its huge casinos, which account for about half of its GROSS DOMESTIC PRODUCT (GDP), and employ one fifth of all working people. (P7) A gambling town to PUT LAS VEGAS IN THE SHADE, it has 35 casinos, attracting gamblers from across Asia, and in particular from mainland China. (P8) While the number of Chinese visitors has recently DIPPED as China’s economy has slowed, the casinos still do big business, and pay very good wages. (P9) The average monthly salary for a full-time casino employee is 19,000 pataca ($2,363; £1,661), according to official figures. This compares with 12,000 pataca in the restaurant sector, and as low as 8,200 pataca for shop workers. (P10) This means that small business owners such as Ms Helm find it difficult to find and retain staff who are tempted away by the higher WAGES on offer in the casinos. (P11) Add high rents, and strict limits on the number of foreign workers, and running a small firm in Macau can be a difficult business. (P12) Ms Helm, 33, who employs 14 people at her cafe, says: “The hardest part is retaining staff, especially locals. (P13) “We can never compete with the big ones [the casinos]. The first thing locals judge is that you won’t be able to pay what they need. (P15) While Macau’s businesses complain about the strict limits on workers from mainland China or foreign countries, the government responds that such immigration controls are necessary due to the region’s small size and POPULATION DENSITY. (P16) The one exception is for people from Portugal, who have an easier time getting residency, thanks to the historical connection. (P17) At the Lax Cafe, Ms Helm says that high rent is her other problem. (P18) “It’s very tough, there’s no limit on increases,” she says. (P19) Ms Helm adds that her rent has increased almost 3x over the past four years, and if it continues going up, she doesn’t think she will survive. If you found the passage difficult to read or had problems understanding specific words or idiomatic expressions, please discuss them with your tutor. The following discussion questions should be answered in your own words and with your own arguments. Briefly summarize the content of the article in your own words. Are rents high in your city? These days, are there many jobs available in your city, or not enough jobs? Have you ever gone to a casino? Do you enjoy gambling? What games do you prefer? Casino and café jobs involve a lot of contact with the public. Do you like that type of job or not? What do the following expressions mean? Practice using each expression in a sentence; extra points if you can use it in conversation.